We stock a wide range of excellent quality Glass Pearls from Czech. They are consistent in size and colour and we can supply a wide range of different diameters and colours. 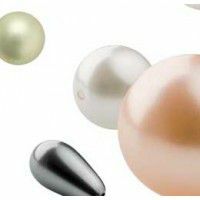 Take a look at the small 2mm Pearls - ideal for use in Seed beading/weaving projects and the highest quality Preciosa Nacre Pearls for the ultimate in quality when you want the best!